I was 7 years old when I started to think of myself as a writer. A few years have passed since then. I still write, because…How do I explain this? Okay. We all eat, we all breathe; right? Some people are absolutely always in love; some people walk around singing; some people need a sports team to cheer for every season of the year…Me, I write. It’s that kind of thing. I’ve written novels, plays and screenplays. I’m a baaad poet. I’ve never been able to craft a short story. I can’t craft a short anything, which is why (as you may have noticed) I’m such a lousy blogger. The other reason I don’t blog is that I just don’t have time. If I’m blogging or whatever, I’m not working on the stories that I want/need to tell. There are only so many waking hours in the day, once you subtract pesky things like making a living, getting dinner and doing laundry, and you factor in the occasional hours with family or friends. Something’s gotta give. We all make choices, right? And my choice is to put the time and energy I have into the stories that are close to my heart…which are pretty much whopping large novels. My books aren’t easily categorized. I know: no Personal Brand; it’s not very 21st Century of me, but I don’t really like putting anyone or anything into a bucket. I expect—and respect—diversity. And I expect the unexpected. There is no excuse ever to be bored, with the world so too full of things to see and taste and mull over, and people by nature being fascinating. So cards on the table: if what you want is to have your attention engaged by a regular flow of Great Content in Multiple Formats (just saw that phrase on an invitation to a Meetup Group, but the caps are my own), or if you need the reassurance of feeling you’re On Trend…if that’s what you’re looking for, I’m probably not the writer for you. But if you like wandering a little off the beaten path and making discoveries…and if you seek out big, beefy stories that you can fall into, stories that seem familiar and at the same time make you think about things you haven’t thought about before…in that case, let me shake your (virtual) hand and say Welcome! I am so pleased to meet you and hope that you and my books will be friends. A few shout-outs to sites that make my world a better place! A few years ago, I was lucky enough to come across Scrivener, an amazing piece of writing software. Scrivener isn’t meant to process words; it’s there to help me work the way my mind wants to work. It’s incredibly powerful and flexible, and yet so intuitive that you can get started within minutes of downloading it. Whatever you write, do yourself a favor and check it out. There is no better way to push out a new idea than to sign yourself up for National Novel Writing Month or one of the other fine NaNoWriMo initiatives. Writing novels is usually a solitary pursuit. 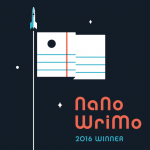 The unique sensation of community support and interest in your work from NaNoWriMo is both a kick in the pants and a nice warm hug.